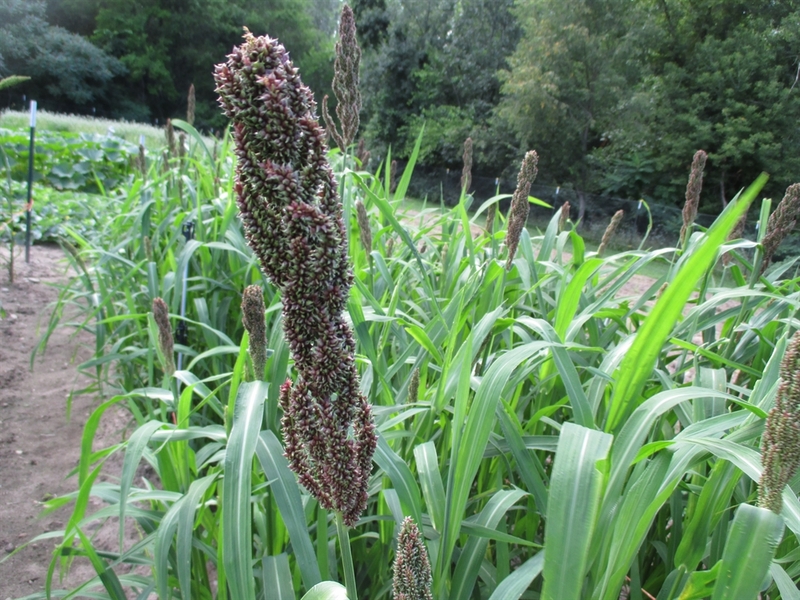 Japanese Barnyard Millet is an early producing and high yielding grain. It is grown as an animal feed as well as for human consumption primarily in Japan, China and Korea. 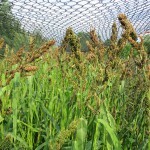 The plant tillers vigorously, producing a tremendous amount of biomass for use in composting, tilling into the soil, and as a grazing crop for livestock and poultry. As a compost crop, the quick growth helps to smother out competing weeds. It will regrow after cutting, and continue growing until frost. 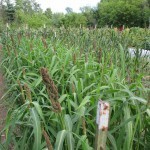 The 6′ tall, leafy plant produces many grain bearing tillers and is tolerant of waterlogged soils. The one drawback is that it is difficult to dehull for human consumption. I have had some success using my hand-crank rice dehuller. There is another method where the dry grain is slightly wetted, and then put into a food processor and pulsed a few times to loosen the hulls, then winnow the grain in front of a fan. I direct seeded my plants the last week of May and harvested my first cutting of seed heads on the 20th of August. I hang the seed heads to dry a couple of weeks before threshing and winnowing. The seed should be planted 1/4” to 1/2” deep in rows or beds. Space 6” to 1′ foot apart. I tie up my plants with posts and twine around the bed to deter lodging. Birds can be a nuisance and I cover my beds with bird netting. This would probably not be necessary for a large plot. Millet needs to be de-hulled. I have included information on de-hulling below. I’m looking for E. frumentacea which most of the literature says is from India and Africa, not Japan. 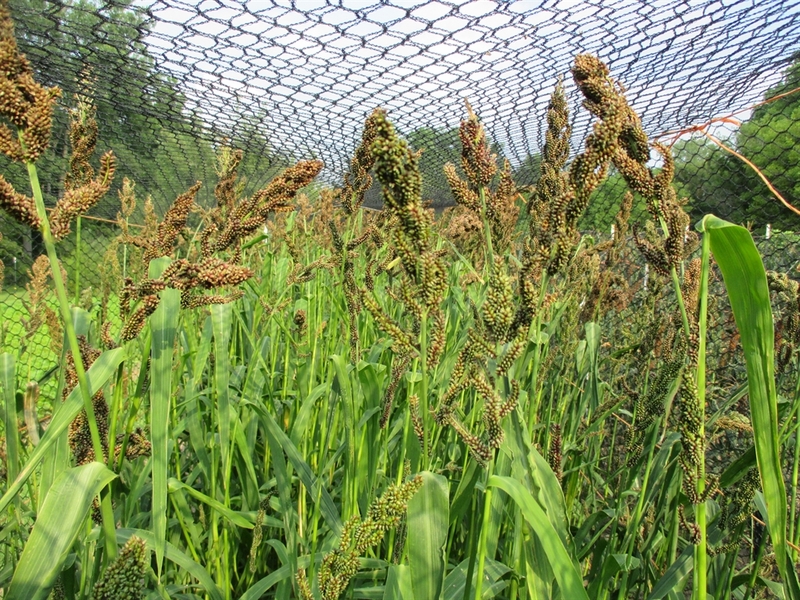 E. esculenta is Japanese barnyard millet. If you can assure me that what your selling is indeed E. frumentacea then you’ll have a customer. My original seed source was Bountiful Gardens in Willits California. 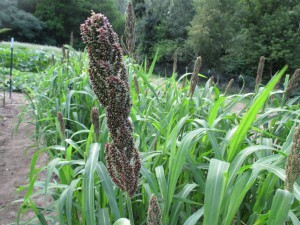 They listed the Japanese Barnyard Millet as E. frumentacea. Thanks for the quick reply. I just placed an order for two packets of E. frumentacea. Had problems getting back to your site from Paypal. While doing so I came across a page that said my order had been cancelled…? I’m hoping that was a fluke. I do not have this available in bulk.